In this week’s portion, Moses continues to encourage and reassure the Israelites, while simultaneously reminding them that their wonderful future is not a result of their own wonderfulness. They will not be “self-made” men and women, though their own efforts do matter a whole lot. It reminds me a bit of a recent article in the New York Times, “Raising Successful Children” by Madeline Levine, http://www.nytimes.com/2012/08/05/opinion/sunday/raising-successful-children.html?_r=1&pagewanted= , which cites a Berkeley study’s conclusion that ” the optimal parent is one who is involved and responsive, who sets high expectations but respects her child’s autonomy. These ‘authoritative parents’ appear to hit the sweet spot of parental involvement”. Certainly Moses, in the name of the Lord, sets high expectations. After all, their future is guaranteed if they only “revere the Lord your God, to walk only in His paths, to love Him, and to serve the Lord your God with all your heart and soul, keeping the Lord’s commandments and laws, which I enjoin upon you today, for your good.” (10:12, 13) Right. It may be “only” for a Moses, and even he blows it enough to be barred from the Promised Land. As for respecting the Israelites’ autonomy, I suppose that’s the whole free will thing – tell them what good and bad can happen, allow them to choose what to do, and hope they choose well enough to not get too badly hurt. Moses provides plenty of examples of the good (miracles like manna and water) and the disasters (like the golden calf episode –which is also a miracle in that the Israelites weren’t totally destroyed) as concrete evidence, and which the current elders (those in their 50’s) can actually remember. Near the end of the portion (11:13-21) are the verses that are the second paragraph on the Shema in our liturgy, which reiterates the “good behavior leads to a good life, misbehavior leads to disaster” theme that recurs through the rest of Deuteronomy. This section also includes commands concerning tefillin (11:18) and mezuzot (11:20), which are themselves to be tangible reminders of this teaching, for a people that unfortunately will need a lot of reminding. Category: BLOG – We’re Not Making This Up! 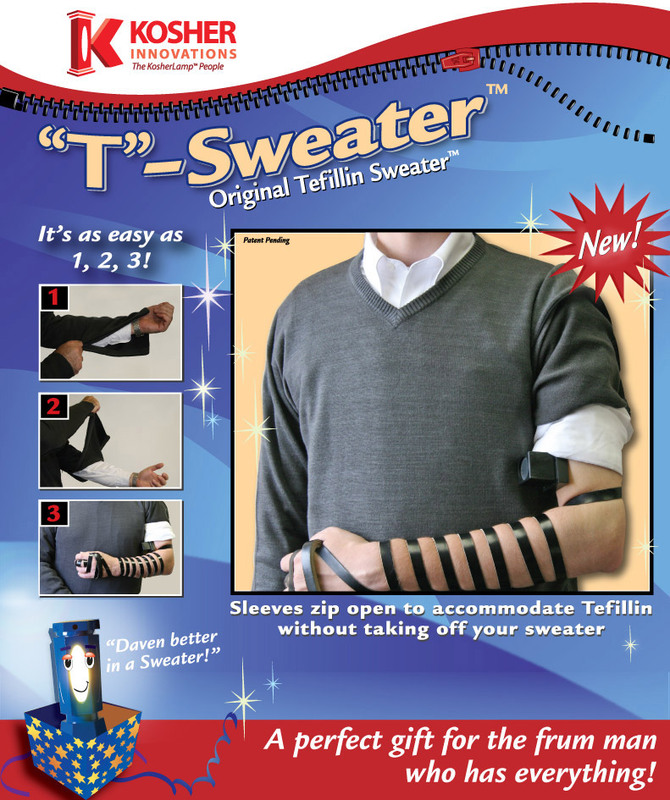 Here is the perfect gift for the frum guy who is too lazy to take off his sweater when putting on tefillin. The sleeve zips open for easy/quick access! Two dynamic mezuzot created by Judaica designer Laura Cowan are destined for space. American astronaut Greg Chamitoff is taking two of Laura’s creations on the next NASA expedition to the International Space Station. Dr. Chamitoff is currently assigned as ISS Flight Engineer and Science Officer on Expedition 17 and will spend six months living and working onboard the International Space Station. This will be his first flight. A pure rocket shaped mezuzah with an abstract “shin” inspired by the windows on spacecraft. Named after The Apollo program – NASA’s 1960’s moon landing mission. A simple rocket shaped piece, inspired by the Space Shuttle – the spacecraft currently used by the United States government for its human spaceflight missions. This sleek piece is crafted in high quality pewter – its durable finish is perfect for outdoor use. Doctor Bloom who was known for miraculous cures for arthritis had a waiting room full of people when a little old lady, completely bent over in half, shuffled in slowly, leaning on her cane. When her turn came, she went into the doctor’s office, and, amazingly, emerged within half an hour walking completely erect with her head held high.